You know that morning after the night before feeling? January is the month after the month before. Christmas has been and gone, New Year is a hazy memory, and all that’s left are half-hearted resolutions and a few extra pounds. Don’t worry, you’re not alone. The Quattro team is here to help. As one of the UK’s leading food manufacturers we supply high street restaurants, chains and food service businesses with menu plans that their customers are looking for. And with the New Year and the new gym membership come the healthy eating resolutions – bring on the veg! And we promise it tastes great too. Our tasty and healthy vegan and vegetarian options include risottos, vegetable chowders and chilli sauces, many of which are dairy and gluten free too. A really interesting food that many of our customers have been requesting in the last few months is Jackfruit. Whatfruit, you may ask?…. Some call it a miracle food. It’s nutritious and sustainable and actually tastes pretty good too. Always ahead of the culinary curve, our innovative chefs have been using it in production for a couple of years. Our Jackfruit Tinga is a firm favourite! A traditional Mexican recipe, Tinga is usually made from shredded chicken or pork in a tomato base sauce with tomatillos (from the nightshade family, a Mexican husk tomato) and chipotles – a smoke-dried ripe jalapeño used for seasoning. The Quattro chefs have created this fool-proof veggie version to rapturous acclaim. 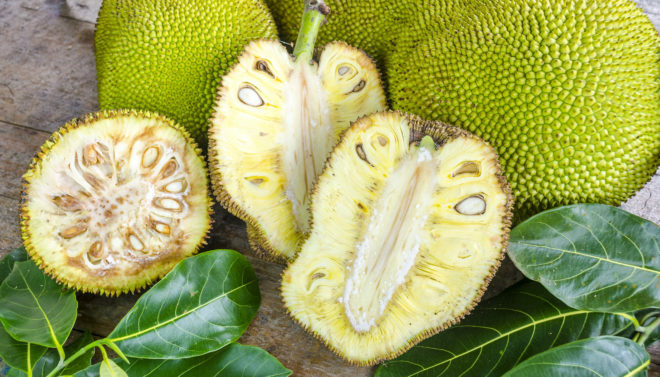 Used commercially as a plant-based meat alternative, each jackfruit is enormous and can feed entire families. When the fruit is young and unripe it soaks up flavours well and when it’s cooked it develops a stringy, almost meaty, texture. Like Quattro, many other food suppliers and manufacturers are increasingly using it in vegetarian recipes for meat-inspired dishes, like jackfruit tacos and jackfruit burgers. Originating in South West India it’s a member of the mulberry and fig family and is now grown internationally. At Quattro Foods we love using it as a meat substitute for our growing vegetarian, vegan and health-conscious customer base. One of the most exciting challenges we’ve faced in recent years is keeping up with the growing demand for plant-based products. Our talented development chefs have truly risen to the challenge, creating colourful and flavoursome healthy sauces, soups, curries, pastes, condiments and other vegetarian and vegan delights. Other healthy alternatives enjoying pride of place in our 2019 product list include tomato, chilli and basil soup; roasted red pepper and corn chowder; Malaysian vegetable curry; Tuscan bean soup; jackfruit puttanesca, smoky aubergine soup, tomato and lentil soup and chicken ribolitta . Other options in our specialist range include gluten-free, coconut & red quinoa porridge, a vegan béchamel sauce and Asian Teriyaki mealpots. So if you are paying the price for an indulgent festive season, look no further than the Quattro kitchen for wholesome, tasty and healthy food. Our customers love them, your customers will love them and everyone can benefit from healthy eating, healthy living and a generally greener, cleaner 2019 – bring it on!